John Mecham was tired of spending money on pricey disposable razors. In his quest for a better option, he invented Razor Renew: a leather tool that manually sharpens and polishes not just razor blades but also knives, scissors, and other cutting instruments. John’s tool is similar to the leather strops that old-school barbers use to sharpen straight edge razors. In the same way, Razor Renew can smooth the burrs and scratches on a disposable razor, bringing it back to like-new sharpness. What’s different is the material. John found that cowhide, which is great for straight edges, is too harsh for thin razor blades. He experimented with different leathers and different designs before settling on a two-sided combination: a suede side to sharpen and hone the metal, and a smooth leather side to buff and polish. The short version is for blades less than three inches long, and the long version works with larger knives, scissors, and other blades. If you’re looking to get more use out of disposable razors, or you want a DIY tool to maintain your knives and scissors, Razor Renew is a handy solution. It’s made in the USA, and it’s designed to last a lifetime if you care for it properly. John wouldn’t have it any other way. Hi Daily Grommet Fans, We all share in the frustration of over-priced razor blades. “Razor Renew” will maintain the sharpness and smoothness of your razor blades giving you up to 10X more shaves. Your “Razor Renew” will give you a lifetime of comfortable and smooth shaves, saving you money month after month, year after year. Just remember to save all your dull razor blades while you wait for your “Razor Renew” to arrive! Will this work for serrated edges? Yes, Razor Renew works very well with serrated edges. What's the practical difference between sizes? Can I use the 15" size with knives? Keep in mind that with the knives/scissors Razor Renew will maintain the sharpness and smoothness of a blade that is already sharp. Razor Renew will not sharpen a dull blade - you still need sharpen the knife/scissor blade on a stone/steel/grinder. Once sharp, if you use Razor Renew before each use you will not have to sharpen on the stone/steel/grinder near as much. Yes, you can use either size for your knives. The the shorter razor renew is most convenient to use with blades that are under 3" long - you can use it on blades over 3" it just takes a little longer and is not as efficient as using the longer Razor Renew. It is much more effective and efficient to use Razor Renew Long on knife/scissor blades that are over 3". I have razor renew and am well pleased with it. I have used it now for over 3 months and am glad to own it. I bout 1 or my son and 1 for my son-in-law. Thanks John! 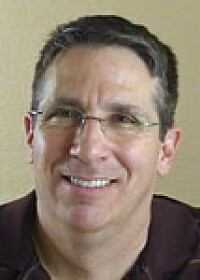 With razor renew, i am able to use one mach 3 razor blade for over 6 months. I definitely recommend this product to all of my friends. Thank you very much, John. 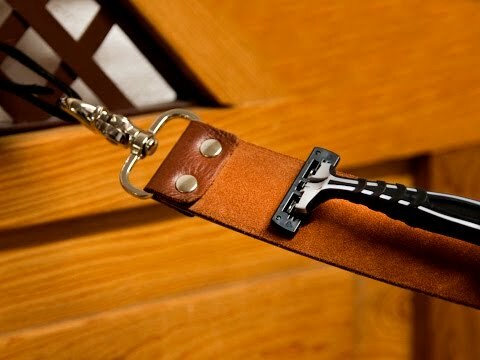 That leather strap has been around for ages sharpening the old fashioned razor blades. I remember by aunt sharpening my uncles straight razor back in the day (for me the 40's). Haha. You just reinvented it for the newer razors and a great idea too. John Mecham was tired of spending money on pricey disposable razors. 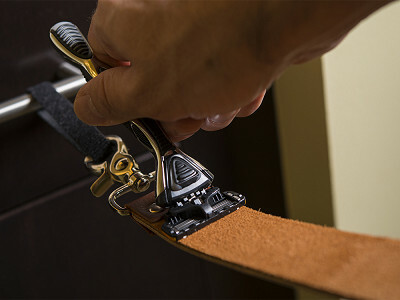 In his quest for a better option, he invented Razor Renew: a leather tool that manually sharpens and polishes not just razor blades but also knives, scissors, and other cutting instruments. 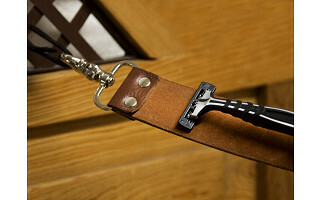 John’s tool is similar to the leather strops that old-school barbers use to sharpen straight edge razors. In the same way, Razor Renew can smooth the burrs and scratches on a disposable razor, bringing it back to like-new sharpness. What’s different is the material. John found that cowhide, which is great for straight edges, is too harsh for thin razor blades. He experimented with different leathers and different designs before settling on a two-sided combination: a suede side to sharpen and hone the metal, and a smooth leather side to buff and polish. 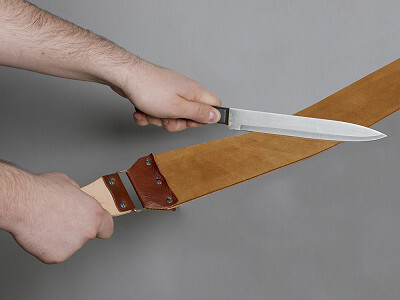 The short version is for blades less than three inches long, and the long version works with larger knives, scissors, and other blades.